Volunteers are being sought to help survey orchards across Surrey so campaigners can raise awareness of the importance of fruit trees to wildlife. The People's Trust for Endangered Species (PTES) said existing data about orchards across England was out-dated and incomplete. The charity has teamed up with Surrey Wildlife Trust to run a field survey in the county. Aerial photographs have showed Surrey has 655 orchards covering 144 hectares. Volunteers are now being sought to record the species, age and condition of the trees. Sue Webber, from Surrey Wildlife Trust, said: "Surrey is one of the most important counties in Britain and Europe for ancient trees. "Orchards can be an important sanctuary for ancient fruit trees, supporting exceptionally rare dead wood species of fungi, beetles and other wildlife." 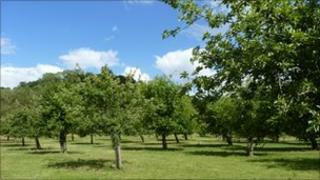 PTES is aiming to complete an inventory of orchards for the whole of England. The research will be used as a basis for conservation projects and to raise awareness of orchards. The charity said 1,800 wildlife species were associated with traditional orchards.